"Be it deep or shallow, red or black, sand or clay, the soil is the link between the rock core of the earth and the living things on its surface. It is the foot hold for the plants we grow. Therein lies the main reason for our interest in soils". Roy W. Simonson, USDA Yearbook of Agriculture, 1957. Most of us gardeners, experienced or novice, tend to take soil for granted and rarely think about it unless our plants are not doing well. However, we really should pay a bit more attention to the nature of soil, as it is truly our friend. Soil feeds and protects our entire planet with the plants that grow in it. Understanding what soil is and where it comes from, will give you a good foundation to build on as you learn to develop and maintain a healthy soil for your plants. Occasionally people will ask us the difference between soil and dirt. Dr. Robert J. Rafka, URI Master Gardener stated it very nicely when he said, "Dirt is found under your nails and in your carpeting.” Dirt is sterile, it lacks nutrients, microbes and invertebrates, does not clump easily and lacks the organic matter and minerals that support life. Soil, by contrast, is the decomposed surface part of rocks and organic matter. It is rich in nutrients and microbes, has lots of invertebrates, forms a clump or loose ball easily when squeezed in your hand, and is made up of organic matter, water, air and minerals. Clearly, plants require soil and not dirt. Soil Formation: Soil forms by weathering, which breaks down the bedrock three different ways. Chemical weathering is from the chemical reactions that occur continuously in our soils, eventually breaking off into small fragments when they are dissolved by water. Biological weathering occurs through the work of microbes. We are most familiar with mechanical weathering that is the result of wind, water, rain, glaciers and the freezing and thawing process. Plant roots also contribute to this abrasive process as they work their way down through the soil in their search for nutrients. This ongoing weathering results in five layers of subdivisions called soil horizons. Each horizon can have two or more subhorizons. These horizons are collectively called the soil profile. 1. The O horizon is made up of organic matter such as partially decomposed leaf litter. This layer is typically only found in forest soils. 2. The A horizon is the top soil, often rich in humus and minerals. It is this layer that most interests gardeners. E, is a soil layer sometimes found below the A horizon that has been extensively leached of clay, iron, aluminum and organic matter. It is pale in color, and tilling usually erases the E level by mixing it with the A horizon. 3. 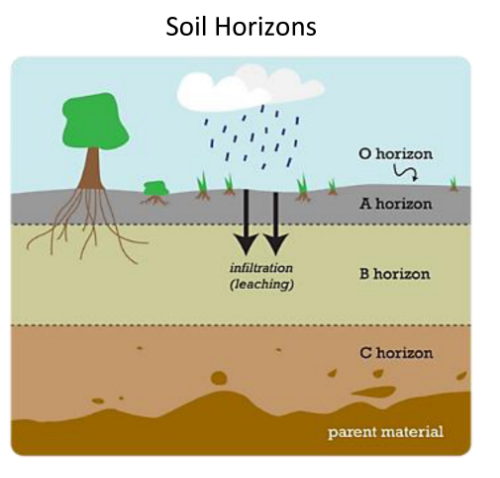 The B horizon is the subsoil. This soil tends to have a higher clay content than the upper horizons due to leaching as described in E, and has a reddish color due to iron oxides. It also contains aluminum and some organic compounds. It is poor in humus and rich in minerals. This horizon aids in regulating soil temperature and air supply for plant roots, as well as providing storage space for plant nutrients and water. 4. The C horizon is made up of loosened parent rock. It contains little or no plant or animal life. 5. The R horizon is the oldest and deepest of the horizons. It consists of unweathered bedrock, which is the parent material of our soil, this parent material influences the soils texture, natural fertility, acidity, mineral makeup and depth. Soil Structure: During soil formation, soil particles are grouped together to form larger aggregates called peds. These range in size from large sand grains to clods that measure several inches. The soil structure refers to the shape of the soil particles (blocky, wedge, columnar, platy, granular, etc.) and how they are held together. This determines water and air movement within our soil. Ideally, within these peds, the pores are small and have good water holding capacity; between them, the pores are large and have good aeration. Strong soil structure such as a blocky or granular shape allows for extensive root development and has good aeration and water holding capacity. Weaker structures such as a platy shape in which the aggregates are thin and closely packed together discourages strong root growth. Weak soil structure can be modified by providing an adequate supply of organic matter to make it stronger. Plant roots also contribute to a strong soil structure. As they grow, they enlarge the openings in the soil, and after they die and decay, they leave channels that allow movement of water and air. The humus that is formed from the decaying roots acts as a cementing agent and allows the development of granular and other strong soil structures. Working with wet soil can damage its structure and over working or over tilling the soil may also cause damage. Weight or pressure on the soil surface will result in soil compaction which will destroy the soil aggregates. Again, regular addition of organic matter is the best way to improve soil structure. Soil Texture: Soil texture is the relative proportions of sand, silt and clay, and refers to particle sizes less than two millimeters in diameter. Sandy soils are the youngest of our soils, thus they have the largest particles - granules of minerals and rocks, usually quartz. Sand particles are easily seen, feel gritty and crumble easily. Sandy soils warm up quickly in the spring, allow free movement of water and air, and plant roots penetrate the soil easily. The disadvantages of sandy soil include its poor ability to hold water, which means that it dries out quickly, causing leaching of nutrients and lower fertility. Clay is the opposite of sand. Clay is much older than sand and has the smallest particles that can only be seen through an electron microscope. There is very little space or pores between the particles, and it is sticky when wet and smooth and hard when dry. This makes it great for pottery, but not so great for our plants. Clay soil holds water and nutrients and can have good fertility. Disadvantages of having clay soil include its hardness - roots have a difficult time penetrating it, it warms up oh…so…slowly in the spring, and it does not allow for adequate air circulation. It can also allow water to sit too long and the soil to remain wet, which deprives roots of oxygen, drowning the plants. Silty soils are somewhere between sandy and clay soils. Although invisible to the naked eye, individual particles can be seen with a light microscope, and a hand lens can provide some detail. Although it is smooth when wet, it is not sticky or slick like clay. When silt soil is dry, it feels like flour. It is easily eroded by the wind and water, and is found at the bottom of lakes, marshes and at the mouth of a river where it meets the sea. It is considered fertile soil and contains many nutrients and holds water in amounts between those of sand and clay. Loam is an ideal soil type, consisting of a well-balanced mixture of sand, silt and clay. And with a sufficient humus content, loam will be well aerated and good at retaining both moisture and nutrients, the ideal condition. Unlike soil structure, you cannot change soil texture easily, so to some degree, we have to work with it what we have. According to the Soil Triangle, there are twelve different types of soil texture classes, with sand, clay, silt and loam being the four “pure” types, and the remaining eight combinations thereof. In western Massachusetts, 90% of our soil is sandy loam. The 10% in the Berkshires that is not sandy loam, is loam. We are more likely to find silt loam in the Valley, followed by loamy sand. Knowing the texture of our soil is of particular importance to us as gardeners because it allows us to make better recommendations for lime, especially if the pH is greater than 6. Clay soils require more additives than other soils to get what they need due to their tiny particle size. All these particles make for a greater surface area, so they require more additives. Although sandy soil has large particles, there are far fewer of them with less surface area, so they require less additives than clay. Because soil changes over time, additives may need to be replenished more often in sandy soils due to leaching. Soil pH: It is important to keep an eye on your pH trends so you know that your plants are able to access nutrients. If your pH is not optimal, even if you have all the elements/minerals essential to plant growth available, your plants will be unable to absorb them. The solubility of many nutrients are limited in extremely acid or alkaline soils. Some elements, such as aluminum and manganese, can reach toxic levels in highly acidic soil. A pH in the range of six to seven is preferred by most plants. New England soil tends to be acidic due to our R horizon (or parent material) being granite, and from acid rain. Soil Inhabitants: As you may know, a critical aspect of healthy soil is its living organisms. Macro-fauna, also called macro-invertebrates, are the living things you can see in the soil. These include moles, shrews and woodchucks, as well as snails, slugs, earthworms, centipedes, millipedes and beetles. They aid soil drainage and aeration by their activities in the soil, keeping it loose, and avoiding compaction. Two other categories of living things found in healthy soil are micro-fauna and micro-flora. Micro-fauna include the tiny organisms that you can see with a low powered microscope, such as nematodes and protozoa. Micro-flora are the bacteria, fungi and viruses that live in the soil. They aid in decomposing organic matter and stabilizing soil structure. Soils with more organic matter tend to have more organisms. Understanding the basics of soil, and using that knowledge to develop and maintain healthy soil can lead to more satisfying gardening. The tiny root hairs that grow off a plant’s larger roots absorb the nutrients and moisture the plant needs from the soil. Root hairs increase the surface area of the root system so the plant has more opportunities to access those nutrients. They have a hard enough job to do without having to fight their way through the physical barriers of rocky, compacted, hardpan soil, or find themselves in poor soil searching for nutrients and moisture. Taking care of our soil, along with good cultural practices, will go a long way toward having healthy, thriving plants.